Vicky lives on a 10 acre property close to Warrandyte State Park. 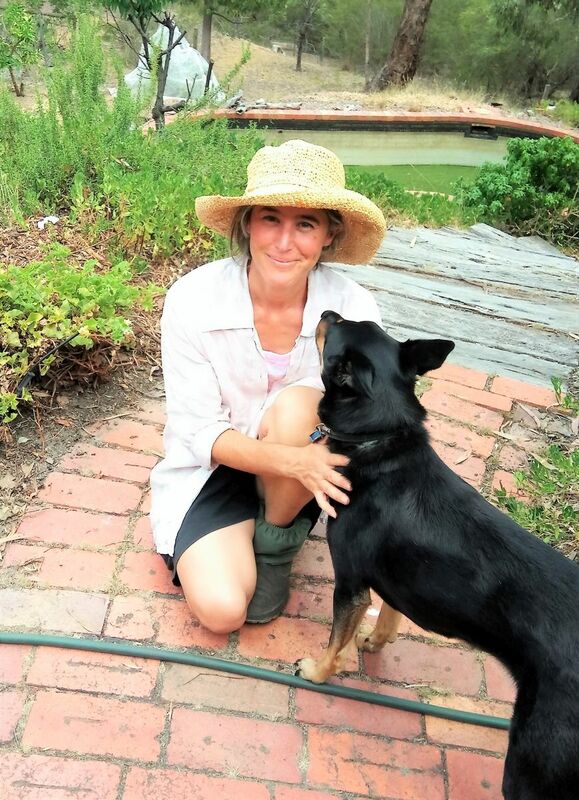 Here’s how Judy Vizzari introduces her interview write up: “Vicky is a gardener with an obvious love of plants and expertise in food production but this garden isn’t just about produce or pretty spaces – it’s clear that Vicky has a deep love of her environment. ‘For me, gardening is about biodiversity – my number one priority is to maintain habitat.’ Hers is a holistic approach – it’s evidenced in the way that she cares for land and its inhabitants, in the work that she devotes to returning her land to its natural state and in her efforts to maintain, not only its vegetation, but also the life it supports.” Read the full interview. On the subject of videos, I’ve just seen this video that Banyule Council have been using to advertise Home Harvest Picnic 2019 on Sunday, 31st March. How many newsletter readers can you spot? And here is a rather odd video of Ben, from Ben’s Bees (Blackburn North), interviewing Adrian O’Hagan, from Permablitz Melbourne. It may sound odd to plant annual herbs in early April but I have come to the conclusion that it is a good idea. 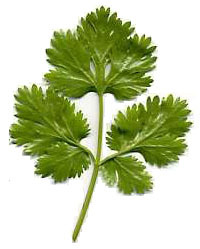 Herbs such as dill, florence fennel, summer savoury, coriander, chervil and German chamomile (the variety used for chamomile tea), all of which are used for their fragrant leaf, bolt during the hot summer months. Climate change has caused a shift in seasons so that once cool March and April are now warm – certainly warm enough to germinate seed – but not too warm to cause bolting to seed. You may not get seed head development but you will get foliage in autumn, winter and spring. Another advantage of autumn sowing of annual herbs is that this is also the time you can collect seed from last year’s plants, giving you fresh seed to sow. 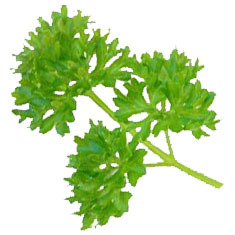 Parsley, while technically a biennial, is usually grown as an annual and can be added to the list. It takes longer than the other herbs to germinate (up to 2 months compared to 10-14 days) but you can speed up the process by soaking the seed for 24 hours. If you are adventurous, you might also plant basil seedlings but, unlike other annuals, basil will succumb to cold weather and be killed off completely by frost. Having said that, my basil lasted into July last year. Sow seed of all annual herbs directly into your garden so as to avoid setback through transplanting. Cover the seed in some way to prevent birds scratching it out and eating it up. And remember to water well from the time the seed is sown until the plant is well established. Live in (or near) Northcote and want some compost? Kate Sage has a composter which generates 20 litres of compost every month or so. She would like to give this compost to either a community garden or individual in Northcote. She is happy to deliver it. If interested, email Kate. Live in Diamond Valley and want some compostable waste? Diamond Valley Greenwaste Share is a new Facebook page which aims “to connect people with compostable waste – e.g. cafes/restaurants – with people who want it – e.g. 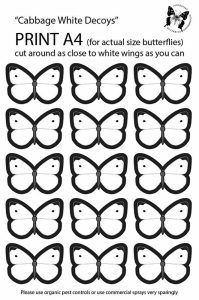 community/home gardeners.” Thanks for the heads up, Isabel Nalato! There has apparently been some vandalism at Bedford Park Community Garden in Ringwood. A scarecrow has been burnt to the ground and some plants have been destroyed. See their Facebook post announcing the news. Wholemilk Continental Cheese Company, in Heidelberg West, wants to employ a casual factory worker to help with: the manufacturing of a variety of cheeses; moving and packing cheese; basic cleaning; and stock rotation. Read more and apply. Can you save seeds from unripe tomatoes? Newsletter reader Angelo Eliades has written a short article on apple tree problems – sun scald. “A hero in the garden, a hero in the kitchen and a hero in the medicine cabinet! Oregano really is an all ’round hero herb!” Read the article. Read more Permablitz heroes of the month. April is a good month to plant your cool season veggies. So, plant those broad beans, peas, garlic and brassicas. Also, plant some leafy greens. Read Helen’s 2016 articles on growing brassicas, growing garlic and on autumn plantings. “Weeds are flowers too, once you get to know them.” by A.A. Milne. As submitted by Jamal Clifford: Why could Granny Smith not drive? Because she was an apple. Melbourne Good Beer Week is May 10-19. There are a gazillion events, mostly around the CBD. Download the program. The eclectic garden (garden tour): Saturday, 6th April and Sunday, 7th April, both 10am-4.30pm; Nunawading. What: Within this garden – where every space is utilised, both horizontally and vertically – not everything is seen at once. There is a rich diversity of botanical specimen trees, selective foliage plants and perennials. ‘Cloud pruning’ of olive trees creates a visual interest. Plantings include many vireyas, begonias, various succulents, edible plantings such as various citrus trees, different currant bushes, and seasonal vegetables. There are meandering paths and quirky garden art pieces. The front garden, with its circular lawn, is surrounded by dense plantings which creates an intimate feeling. Another special feature is that artist Jo Reitze will be painting the garden over the weekend whilst it is open. Cost: $8 (students $5, under 18 free). What: Around 12 stallholders will showcase their gins, including: Imbue Distillery (Eltham), Patient Wolf Distilling Co. (Brunswick) and The Craft & Co. (Collingwood). Cost: $10 (includes free tastings). What: Karen Sutherland, from Edible Eden Design, will focus on maximising yield through disease management, pruning techniques and cultivar selection to get the most out of apples, pears, grapes, fig, mulberry, persimmon, kiwi and berries. 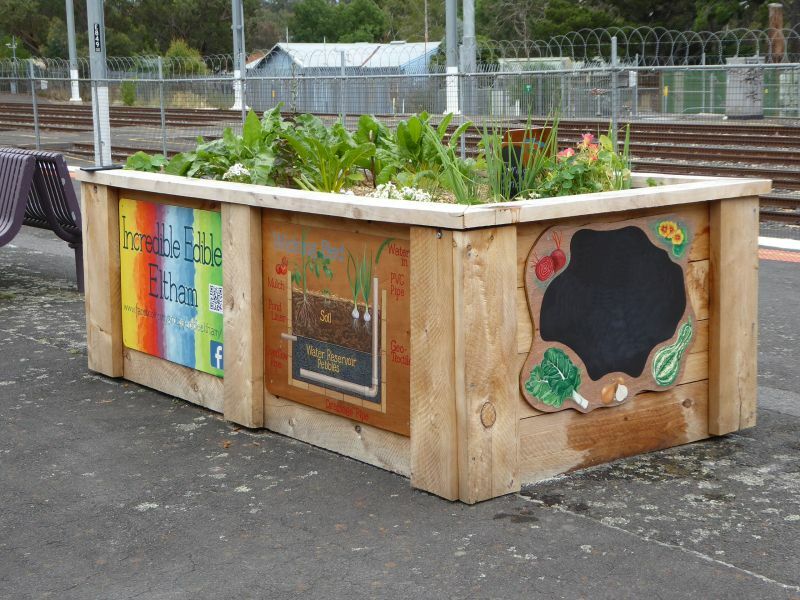 Composting to improve your soil: Thursday, 16th May, 11am-midday; Fawkner Library. What: Facilitated by Tash van Velzen. Understand what is really going on in the compost heap and worm farm. Edible weeds walk: Saturday, 18th May, at 11am-1pm and again at 2-4pm; Brunswick East. What: What if many of the weeds in our garden were just as edible as the vegetables we tend beside them? What if some of these free, all-too-easy-to-grow uninvited guests were so nutritionally dense that they are just about the healthiest things you could possibly eat? What if many of them also had medical traditions dating back centuries? Well it’s all true! And if you know what to choose, they also taste great. Join Adam Grubb, co-author of The Weed Forager’s Handbook, for a fascinating walk on the wild side. Sticky date with the Backyard Honey beekeeper: Saturday, 18th May, 11am-2pm; Bunnings, Nunawading. What: Facilitated by Peter Dyer, from Backyard Honey. Watch a live honeybee colony at work. Taste raw cold-pressed Victorian honeys and discover what you can do to sustain healthy bees and pollinators in our community. What: A selection of Thai inspired dishes will be demonstrated, plus practical staples – 5-8 dishes in total. Everything will be vegan, based around the core staples of fruit, veg, starches, whole grains, legumes, nuts and seeds. Cost: $100 (includes sit down 3-course meal). Thai inspired vegan cooking class: 3 occurrences – Sunday 14th April, Sunday 12th May, and Sunday 19th May, each midday-4pm; The Beet Retreat, Smiths Gully. What: A selection of Thai inspired dishes will be demonstrated, plus practical staples, including cashew yoghurt, plant-based milk and nut parmesan sprinkle. Everything will be vegan, based around the core staples of fruit, veg, starches, whole grains, legumes, nuts and seeds. What: What you will learn: how to temper chocolate to create a shine and crispy snap; how to create ganache; and let your creativity shine through as you decorate your truffles. What you will get: a box of truffles that you have handcrafted; and a starter pack – apron, dipping tool, chocolate, recipes. Once you know how to temper and how to work with chocolate, your imagination will be your only limitation. They will make a ganache for the filling, revealing the small tricks that ensure a smooth outcome. Vegan brunch cooking class: 3 occurrences – Monday 22nd April, Thursday 25th April, and Sunday 26th May, each midday-4pm; The Beet Retreat, Smiths Gully. What: Learn how to create healthy, practical, everyday vegan dishes that look as good as they taste. It will include such dishes as plant-based milks, creamy lemon dream porridge, waffles, pancakes, scrambled tofu, chia puddings and smoothie bowls. What: A selection of dishes will be demonstrated, plus practical staples, including cashew yoghurt, plant-based milk and nut parmesan sprinkle. Everything will be vegan, based around the core staples of fruit, veg, starches, whole grains, legumes, nuts and seeds. Introduction to composting and worm farming: Wednesday, 27th March, 7-9pm; Mooroolbark. Healthy productive compost and worms: Thursday, 28th March, 6.30-9pm; Bulleen Art and Garden. Learn how to make good coffee (2 day): Thursday, 28th March and Friday, 29th March, both 9.30am-3pm; Heidelberg West. Kevin Heinze GROW Spring open day and autumn plant sale: Saturday, 30th March, 9am-3pm; Doncaster. Preparing for the Winter harvest: Saturday, 30th March, 9.30am-12.30pm; Bulleen Art and Garden. Beeswax wrap workshop: Saturday, 30th March, 10am-midday; Central Ringwood Community Centre. The Autumn Harvest Festival: Saturday, 30th March, 10am-3pm; Yarra Glen. Green at Kathleen – seed saving and sowing: Saturday, 30th March, 11.30am-1pm; Kathleen Syme Library. Dessert beer and sweets master class: Saturday, 30th March, 12.30-2.30pm; 3 Ravens Brewery, Thornbury. A Naturally Good catch up at That’s Amore Cheese: Saturday, 30th March, 2-4.30pm; That’s Amore Cheese, Thomastown. Beekeeping workshop: Saturday, 30th March, 2-4.30pm; Bee Sustainable, Brunswick East. Wicking bed workshop: Sunday, 31st March, 10am-midday; Melbourne Food Hub, Alphington. Ringwood Highland Games: Sunday, 31st March, 10am-5pm; Ringwood. Chardonnay master class: Sunday, 31st March, 12.30-2.30pm; St Andrews. Home Harvest Picnic 2019: Sunday, 31st March, 4.30-8pm; Edendale. Heritage apple tasting: Sunday, 31st March, 5-7pm; Petty’s Orchard, Templestowe. Farm play: Tuesday, 2nd April, 10am-midday; Joe’s Market Garden, Coburg. Bush skills and kids farming: Tuesday, 2nd April, 4-5.30pm; Joe’s Market Garden, Coburg. Healthy eating and nutrition: Wednesday, 3rd April; Eltham Living & Learning. Sourdough and grain preparation – making grains great! 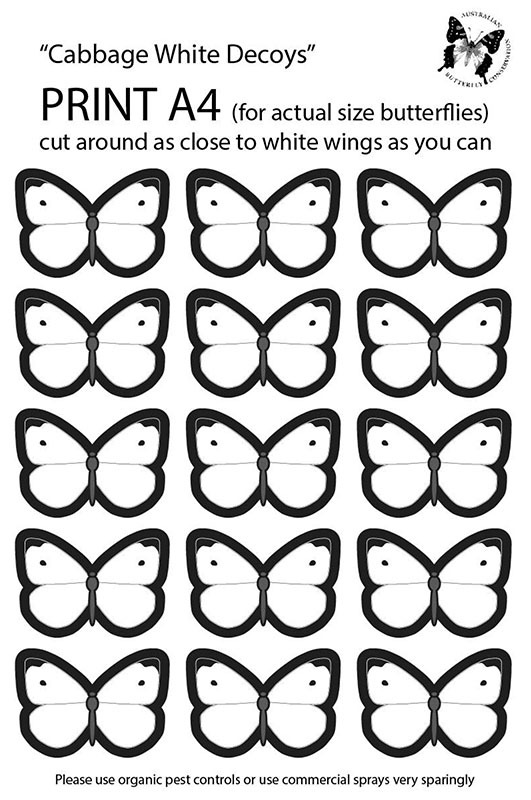 : Thursday, 28th March, 6.30-9.30pm; Ringwood. Italian cooking: Thursday, 28th March, 7-8.30pm; Mill Park Library. Cook Indian by the creek: Friday, 29th March, 6-7.30pm; Diamond Creek. Thermomix saving time & money – demonstration class: Friday, 29th March, 6.30-8.30pm; Warrandyte. Seasonal ferments – kimchi + kombucha: Saturday, 30th March, 9-11.30am; Bee Sustainable, Brunswick East. Indian Punjabi cooking workshop: Saturday, 30th March, 10.30am-1.30pm; Diamond Creek. Passata-making afternoon: Saturday, 30th March, 3-7pm; Fawkner Bowls Club. Minimising food waste workshop: Sunday, 31st March, 1-3pm; Murundaka, Heidelberg Heights. Easter cupcake decorating demonstration for adults: Monday, 1st April, 10.30-11.30am; Thomastown Library. Hop into Easter cooking and craft with Carol From Kazzy’s Kitchen: Tuesday, 2nd April, 1.30-3pm; Lilydale Library. Weight loss cooking (thermomix): Tuesday, 2nd April, 7.30-9.30pm; Kilsyth.